The shakes at Black Tap are nothing like you have ever seen before. At Black Tap you will find the most insane shakes with toppings like a slice of a cake, brownie, cookies, chocolate, cotton candy, etc. It will be hard to pick one since all of them look amazing and taste great. The ice cream at Soft Swerve looks beautiful and tastes delicious. 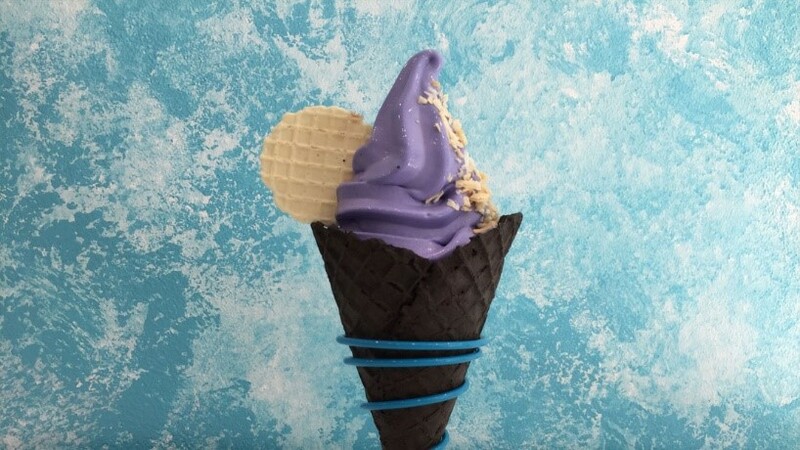 Their most popular flavor is the ube purple yam served on a black chocolate cone. However, you can choose among different flavors such as green tea and matcha. They also have many different toppings and red or a classic cone available. You have probably tried a burger and/or a sushi before, but now imagine trying both together. You can try this awesome combination at Redeye Grill. A burger made of spicy yellowfin tuna instead of beef and a rice bun instead of a bread bun. When people think about Magnolia’s Bakery, is normal that the first thing that comes to their mind are their cupcakes; however, the banana pudding is delicious and is must-try at Magnolia. The banana pudding includes fresh bananas, vanilla pudding, and vanilla wafers. They also have an irresistible chocolate version. The pretzels from Sigmund are the best you will ever eat. At Sigmund, you will find variations from the classic pretzel to pretzel sandwiches. These soft pretzels are delicious and can be tasted in different flavors such as garlic parsley and truffle cheddar. If you like sweet, then you can try their churro pretzel which is as good as the savory ones. If you want to try any of those awesome foods, make sure you arrive early because most likely you will have to wait in line. You must be thinking, wait in line? Welcome to NY where the places that sell awesome and different food means you will have to wait in line to consume it. But it will be worth it! What are you craving to try? Let us know in the comments below.